In iOS 7 Apple decided to remove one of the most handy features of iOS 5 and 6, the Tap to option for quick posting to Twitter/Facebook. But a jailbreak tweak brings it back. Quickly rattling off a tweet or posting to Facebook has been a cool feature of iOS since version 5, which introduced Twitter integration, and then version 6, which added Facebook integration. 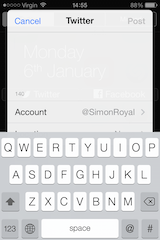 All you needed to do was sign in to both accounts on your iDevice, and then when you pulled down the notification centre you were faced with two buttons, Tap to Tweet and Tap to Post. Pressing one of these meant you could send a tweet and post to Facebook without opening the relevant app. 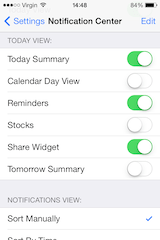 However, when Apple started posting iOS 7 betas, it was soon noticed this was feature missing. With each beta release we hoped it would be put back, but even when the final was released it sadly didn’t make a return. 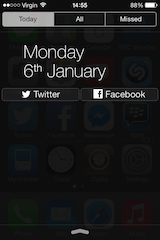 With an iOS 7 jailbreak not in the picture for a while, it looked like we had to miss out on this feature. 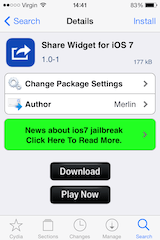 However, with the recent release of the jailbreak evasi0n 7 from the evad3rs team, it blows iOS 7 open for third party hacks and tweaks. I was told about this fabulous add-on – I don’t like to call it a hack – a few days ago, and the fact that it works so well is fantastic news. First of all, you will need to jailbreak your phone. It is very simple these days, instructions can be found here. Once done, you need to open Cydia and update it. This only takes a few minutes. 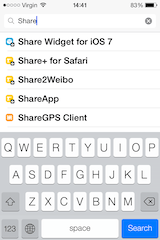 Once done, search for Share Widget iOS 7. Install it and let Cydia do its thing; once complete you will need restart springboard. 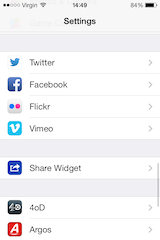 You will need to go in to Settings > Notification Center and turn on Share Widget. 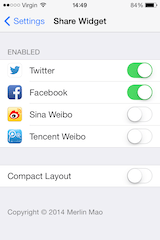 Then go into Settings, scroll all the way down to Share Widget, and turn on or off the apps of your choice. Now you are all set. Now all you need to do is pull down the Notification Centr,e and you will see the two buttons just like you did in iOS 6. Pressing each button brings up the post window. Now you can send a tweet or update Facebook the easy way. Utterly brilliant. NOTE: not all jailbreak tweaks work with the iPhone 5s due to its 64-bit architecture, but they are slowly being updated.